In retrospect, it’s amazing just how far the Beatles managed to reach in popularity–and productivity–in such a short time. They’d been, for all intents and purposes, a bar band from their humble beginnings in Liverpool all the way to their Hamburg days. It was only by chance that Tony Sheridan had asked them to be his studio band for a release. It wasn’t until the end of 1962 that they’d gotten lucky, finding an excellent manager in Brian Epstein and a young and open-minded studio producer in George Martin, and hit #17 on the UK chart with their debut single. In the ensuing two years, they released not one but four albums, eight singles and an EP, all containing new recordings; shot and released a hit movie; made multiple appearances on both radio and TV; toured in Europe, Australia and parts of Asia, and had a level of success in the United States not seen before by any pop musician from Britain. There aren’t that many bands nowadays that do that much in the span of two years. All things considered, 1964 was a banner year for them. When they touched down on American soil on 7 February, they were met by loud and emphatic screams and cheers of teenagers who found the band the perfect antidote for post-Kennedy gloom and ennui. In March they started filming A Hard Day’s Night. Every release eventually hit Number One on both the US and UK charts (or at least close to it)–in fact, they hit the rarest of feats: on 4 April, a few weeks after “Can’t Buy Me Love” was released, they had songs in the top five positions on the Billboard singles chart, four of them on different labels: the Vee Jay single “Please Please Me” at #5, Capitol’s “I Want to Hold Your Hand” at #4, Swan’s “She Loves You” at #3, Tollie’s “Twist and Shout” at #2, and Capitol’s “Can’t Buy Me Love” at #1. [They also had an additional seven singles in the Top 100 on that day, totaling an astonishing twelve singles on one chart.] At the end of April, John Lennon released his first book of poetry and literary silliness, In His Own Write. Their movie was released to thunderous applause in July. By midsummer they were on tour, and by August their first official US tour commenced, two straight months of continent-crossing mayhem. All this action with nary a second to breathe, and it nearly did them in. Part of this was obvious–no one had expected the teen fans to be screaming throughout the entire show, not like the Cavern days when the boys could mingle with the crowd after their set or even in between songs. British crowds were noisy, but they certainly weren’t on the verge of hysteria. Shows were booked at halls much too small for their American fanbase, and their sound system was meant for a much smaller space–in such a cavernous hall amidst thousands of howling teens, their amplifiers just weren’t going to cut it at all. They were held captive in their own hotels most of the time, unable to do anything except play cards, write songs, and watch television. There was also the fact that the tour had not been planned according to the size of the country they would be in. In Britain, one could get away with playing in Liverpool, do a show the next day in London, head up to Glasgow and do another show a day or so later, and head over to Blackpool the day after that, with only their chauffeurs and drivers feeling the strain. In the US, they’d hopped from one major city to the next with nary a day off in between–and traveling thousands of miles between shows by air or land. It was exhausting and disorienting. And yet…despite the ups and downs, the noise and insanity, they’d made it. Beyond their wildest dreams, they’d made it to the big time. 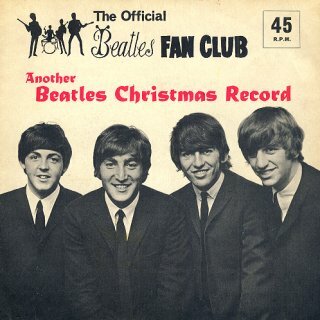 “Another Beatles Christmas Record” was recorded on 18 October, the same day they recorded Ringo’s cover of “Honey Don’t”. Much like the previous year’s Christmas message, it was a semi-scripted four minute track (written by their erstwhile publicist Tony Barrow) full of thank yous and year-end reminisces with the typical Beatle silliness thrown in for good measure. They sound much more relaxed and unrestrained, not just going offscript but breaking the fourth wall multiple times (“I wrote a book it says here [in the script]!” says John). The exhaustion that shows on their faces on the Beatles for Sale cover can be heard in their voices here, as they don’t sound nearly as bouncy and full of energy as the previous Christmas single, but regardless, they must have been thankful, if not a bit blown away, by the reception they got from all their fans the world over, and made sure they received the next holiday single. Come the end of this banner year, the boys finished up with another seasonal run of shows at the Odeon Cinema at Hammersmith, London, similar to 1963’s year-end shows. By this time they were on home turf, worn out but able to relax at the end of it all. They had another busy year ahead of them, with another round of touring around the world, two more albums and a few singles to record, and a second movie to film. It would be similar to 1964, and again it would nearly drain them. Music-wise, however, things were changing. They’d learned a lot in the studio over the course of two years…even George Martin began devising new ways to record the band that would not only save them time but make the process more creative and relaxed. The band would take in even more outside influences, moving away from the American soul and Motown of the covers they’d cut their teeth with and onto the country and folk of the American troubadours like Bob Dylan. The lyrics were becoming less doe-eyed and more introspective, already hinted at on many of John’s contributions to Beatles for Sale. If 1963 had been their rise to UK stardom and 1964 had been their US rise, then 1965 would be the year of change, personally and professionally. Next Up: The “Ticket to Ride”/”Yes It Is” and “Help!”/”I’m Down” singles, and Help!